It is hard to believe but it has almost been one year since we first started fundraising to help Syrian refugees living in Jordan. Since then (and you may want to sit down for this) we have collectively raised $27,998(!!!). Donations continue to come in to our Mercy Corps page (a special thanks to the recent incredible support from Catherine, Jerry, and their friends) and it feels so good to have helped seriously improve the circumstances for so many individuals and families. Sadly, the situation in Syria has only deteriorated and the need for aid continues grow but we should all be really proud of the impact that we have made. Your donations are making a real difference! – Volunteers distributed over 3,500 children’s packages which included a warm winter jacket, winter clothing, hat, gloves, scarves, socks, toys, coloring items, hygiene items, etc. We were also able to supply thick winter blankets to another 500 children. We also bought 200 gas cooking stoves and 200 heaters in December alone! – Mercy Corps ran a winterization program for 3,600 families and many of our children’s winter packages complemented those as the MC ones did not include clothing. Added to the 3,600 families packages were 20,000 toothbrushes and 3,600 packets of detergent funded from the HRJ donations. – The group has held training workshops for volunteers to help at Children’s Activity Days and they continue to host these programs in Zarqa and Mafraq (Northern Jordan) for groups of Syrian children on a regular basis. – Thousands of books have been purchased for informal schools, a playground was built in the town of Azraq, and we continue to purchase wheelchairs and hearing aids for people with disabilities. – Over 400 Syrian children have been identified as out of school and been placed in formal schools through HRJ. This is an ongoing effort and MC expects an additional hundred to be added this month. – 11 marathons in 11 days, a fundraiser planned by HRJ, is taking place in March. The distance run in the marathons will reach the full length of Jordan. All funds raised will go towards education-specific purchases. – Several local Syrian and Jordanian volunteers of HRJ have, after training with Catherine (the director), received internships and jobs. – Income-generation projects have included buying tools for carpenters, starting businesses to sell SIM cards, setting up 6 families to raise chickens for eggs to eat and sell, providing bikes for long distance commuting for work, arranging transport to the British Council for free English lessons, and starting women’s cooking projects. – Mercy Corps supports IOM (http://www.jordan.iom.int/) shelters for trafficked women. These are just a few highlights and the more support we receive, the more we can do! As always, thank you for your support; we couldn’t have done it without you! We continue to accept donations here: (http://www.mercycorps.org/people/catherine-ashcroft/refugees-jordan). If you are interested in continuing your support, please mention Lexi’s name (Lexi Shereshewsky) in the comments so we can thank you personally! Alex is the 13-year-old son of an American-French ex-pat family living in Kuwait, though he spent most of his childhood in Amman. As a member of the boy scouts, Alex has been an active volunteer helping refugees living in Jordan. This year, for his Eagle Scout badge, Alex started Operation Puppet Pals. He rallied 100 volunteers of twenty different nationalities across borders and together, they made over 1,000 sock puppets for Syrian refugee children in Jordan. Alex reached out to Mercy Corps and was put in touch with Catherine, the Director of Resource Distribution with whom Demetri and I worked. It was a perfect opportunity, Catherine explained to him, as we had just started the ‘welcome kit’ project. The bags of crayons, coloring books and small toys that we funded were being assembled by the boy and girl scouts of Amman. When Alex arrived, as the last part of Operation Puppet Pal, he would be able to add the final piece – a colorful, cuddly, and comforting sock puppet for each kit. We are proud to have been able to work with Alex and the rest of the scouts to make these bags possible. This was a beautiful example of children helping other children in need. We can all learn something from the generosity and dedication that Alex and the rest of the kids showed to bring the project to life. We’ve made a tremendous impact for people over the past two months and to be able to help children like this is really special. This is such a unique opportunity and we are thrilled to be able to continue to make a difference for people in this terrible time. (Get involved! http://www.gofundme.com/249yoo). We hope you enjoy these photos as much as we do. We received an update from Catherine at Mercy Corps today on the status of the art/toy kits for children and it is great news! Volunteers spent Sunday shopping in downtown Amman and purchased crayons, coloring books, drawing paper and candy (made in Syria). All purchases were funded by our donations. 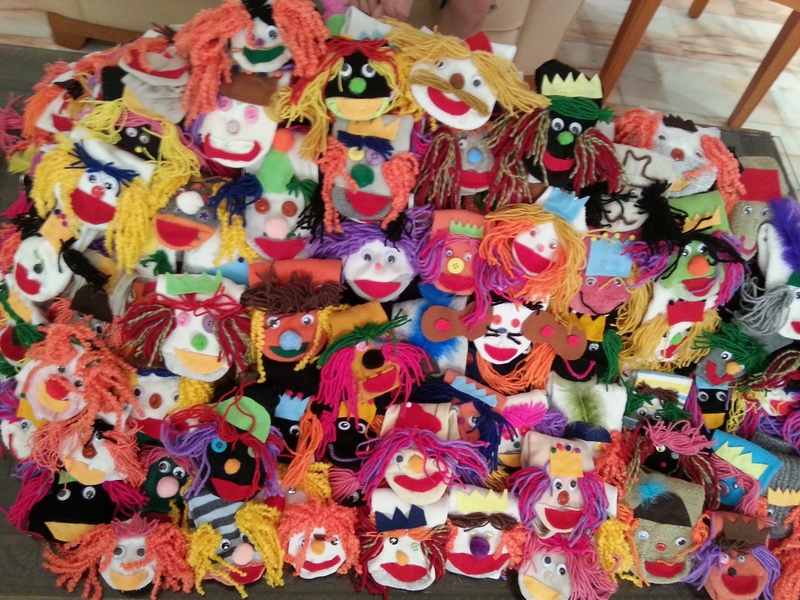 An additional donation of 1,300 sock puppets from groups in the US and Kuwait will be added to the packets (see photo attached). They will have a description in Arabic on how to use them. Volunteers from the Boy/Girl Scouts of America troops in Amman will be helping the team sort and assemble the kits. As Catherine and volunteers mentioned, it was a very fulfilling five hours on Easter Sunday. We are so glad that we are able to keep up our efforts from the US! Thanks and we’ll keep you posted with any new developments. The last few days of our trip flew by. It feels like a world of things happened since we last wrote on Tuesday night. We spent our last day in Mafraq returning to the five homes we had visited the day before. We brought mattresses, blankets, plastic rugs, gas canisters and stoves. People were so happy to see us again, thankful that when we said we’d come back, we really did. Women kissed me on both cheeks, men shook hands with Demetri, and children ran up to welcome us back. Church volunteers carefully copied down each family member’s name and kept track of items distributed. This was done to ensure that each household received the same basic supplies. There were difficult moments. At one home we visited, the husbands of two of three sisters living in a converted storefront got in a physical fight over whether one family would be able to take the stove and gas canister with them when they left for another apartment. While Demetri and the other men broke up the fight, I stood on the far side of the room squeezing the hand of a 15 year old girl. She shook her head and said that she wanted to go back to the Zaatri camp which was, in her words, ‘heaven’ compared to their current living situation. Another woman we visited was clearly suffering from PTSD—her eyes were glazed over and she had trouble remembering that we had visited her the day before. Her two children were sick and the family’s poverty was so severe that one of the aid workers suggested that they might be better cared for in the Zaatri Camp. In every neighborhood we visited, it was obvious that there were many families—Syrian and Jordanian—in need of help. No sooner had we handed a package of diapers to one Syrian mother than there appeared two others asking for similar handouts. The church volunteers were incredibly patient. Every time one of the Syrians was upset over not receiving one item or another, the lead volunteer calmly explained that there were many families that needed help, and if a representative of the family would register at the church, volunteers would follow up to help them as best they could. Despite the difficulties, there were also beautiful moments. When we visited the families on Tuesday, we had brought small gifts of colored pencils, crayons and paper for all of the little kids. At the second home we visited, the children came out of the house holding the crayons in their hands. I asked the oldest girl, 9, if she had drawn anything since yesterday. She said yes, taking my hand and leading me into their home. Along the wall were about 8 pictures they had drawn. They were so beautiful and you could see that they were so proud. These poor little kids have gone through so much trauma. They aren’t in school and don’t have opportunities to explore their creativity or escape their daily lives. It felt so good to have been able to bring that to them. We brought in a few more gifts (funded by your donations): construction paper, extra crayons, coloring books, and Arabic children’s books. The eldest girl promised us that she would read them to her brothers and sisters. It’s hard to know how long people will be in this situation. The war gets worse each day and people are left with literally nothing; nothing in Syria and nothing in Jordan, either. Several of the refugees told us that their homes were reduced to rubble in the fighting. When the war ends, it will take time for people to be able to go home again. The country is broken, infrastructure destroyed; people will be afraid of what and who they return to. But they yearn to be back. Leaving each family’s home, we told each other ‘see you next time in Syria, Inshaa Allah (God Willing)’. We made a huge impact with your support. In less than 30 days, we were able to raise $9,770 from 123 donors. We spent every dollar you donated directly on clothing, formula for babies (600 1 lb. tins), diapers and sanitary napkins (approximately 190 packages of 48 child diapers, 230 packages of sanitary napkins, and 120 packages of adult diapers for the elderly and the injured), and we funded a Mercy Corps project to provide toys and art supplies to children as part of the starter kits described above. The pictures attached show the items we bought but they can’t show how appreciative the families we met were to receive these basic necessities. We are both committed to carrying on our efforts. Several of you have reached out to us about continuing to support Syrian refugees. We will continue to accept donations on our gofundme site (http://www.gofundme.com/249yoo) and work with Catherine (our contact at Mercy Corps) to invest donations where they are most needed. She has agreed to provide us with receipts and photographs of items that are purchased with our donations. If there is something specific that has touched you or you feel that you want to be more involved in, let us know. Opportunities we discussed with Catherine include sponsoring specific families, donating to Pastor Nour’s church and his local efforts, and continuing to purchase in-kind donations like those we bought this past week. We encourage you to pass along our emails and the link above with anybody you think might want to help. This has been an incredible experience for both of us. Thank you again for being a part of it. We’ve spent the last two days in Mafraq at Pastor Nour’s church. 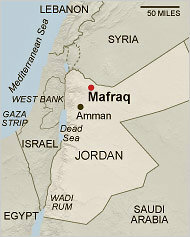 Mafraq (which means crossroads in Arabic) is a city of about 60,000 on the Jordan/Syria border. Since the conflict started in Syria in 2011, refugees have flooded the town. Today, approximately 15,000 refugees live inside the city (the main camp, al-Zaatri, is only a few miles away). Rent prices have skyrocketed and, unable to work, the Syrians are forced to live in terrible conditions. Pastor Nour began his mission when there were fewer than a hundred refugees. He started distributing the most basic essentials to people: mattresses, pillows, and gas stoves. As the situation worsened and the number of refugees increased, he too increased his efforts. Today, he has a community of both Jordanian and international volunteers and cooperates with major NGOs like Mercy Corps to continue his community outreach program. With the donations we raised, we purchased 600 one-pound tins of powdered baby milk and another large shipment of diapers and women’s sanitary pads to be distributed through the church. In fact, Lexi was able to hand out some of these items today to a group of 20 Syrian women. They also selected clothing for themselves and their families from the bags we sent you pictures of last time. The process begins when the church registers new refugees as they arrive to Mafraq. They hold distributions at the church (like the one Lexi helped with), taking care to ensure that people are treated with respect and dignity. People have lost everything and it is humiliating to have to beg for simple things like second-hand clothing and milk. In addition to distributions, field workers visit individual family homes to check in on them, bring supplies, and lend an ear and a shoulder for support. Several volunteers mentioned how important it is to Syrians to host visitors—perhaps because hospitality is such a deeply ingrained part of the culture. We’ve spent the last two days sorting supplies and accompanying the field workers on their visits. The situation varies from family to family. The first family we visited arrived from Homs, Syria three months ago. Over Arabic coffee, they told us about the situation in Homs, their loved ones who were injured or killed, and their homes that were destroyed. Like most Syrians, they were processed through the Zaatri refugee camp. Although food, tents, medical care and schools for children are provided by the United Nations, many choose to leave because of poor conditions, security concerns, or maybe the humiliation of living in a camp. Syrians can go only if they are sponsored by a Jordanian or someone living outside the camp. With so many new arrivals, the cost of living in Mafraq has increased dramatically so it’s hard to know whether they’re better off in the camp or on their own. This became quite clear this afternoon when we accompanied one of the Jordanian volunteers to visit newly-registered refugees. After leaving the camp, each family (or group of families living together in most cases) is eligible to receive a ‘starter package’. This includes mattresses, blankets, pillows, a gas stove and gas canister. The amount of assistance provided depends on how many members are in the family, the family’s financial situation, and amount of help they’re receiving from other charities. One family we visited lived in a storefront that was divided for privacy with UNHCR-issued blankets. Another, a family of four, lived in a concrete room with no bathroom behind a large animal corral. While a Jordanian church volunteer verified the families’ information and needs, we passed out small gifts for the children (colored pencils, crayons, drawing paper, and sweets). We will return tomorrow to each of the families we visited today to deliver the starter packages and spend time with families. It’s late so we can’t write more. We’ll send another update tomorrow with pictures. Thank you again for all your love, support, and donations! Hello from Amman, Jordan! First and most importantly, thank you again for all of your support and donations—we passed $9,000 in total donations yesterday!! Lexi and I landed Friday evening and went straight to the apartment we’ve rented for the week. The manager of the property, Sama’an, met us and took us out to eat hummus, falafel, and other Arabic food we’ve been missing. It feels great to be back in the Middle East and speaking Arabic. Yesterday morning, we met up with a group of Mercy Corps volunteers to shop for second-hand clothing to bring to Mafraq tomorrow. Our team was made up of two Jordanian-Palestinians, three refugees from Eastern Syrian near the ruins of Palmyra, a documentary filmmaker from France, and a Syrian-American from California. With our eclectic group assembled, we went from shop to shop, filling huge sacks with used clothing. Suha, the lead negotiator, would introduce herself and explain that we were buying supplies to bring to Syrian refugees. It seemed the bargaining tactic was to introduce the Syrians next. Abdul-Salaam did the talking: a mixture of joking, cajoling, and appealing to the owner’s generosity, religion, and hospitality. People here have mixed feelings about the refugees: they are undoubtedly a strain on the economy and bring security risks but almost half of Jordanians are of Palestinian origin and thus relate to the refugee experience. In the end, the shopkeepers always relented. We bought hundreds of pairs of shoes for less than $3/pair, at least a thousand sweaters and shirts at four for $1, about 350 pairs of jeans for under $1.50 a pair, and a few hundred pairs of socks and underwear (new). Moved to generosity and impressed by the sheer amount that we purchased, each shop owner threw in an additional bag (at least) of merchandise free of charge. By the end, we had about 25 large sacks full of clothing (see pictures below). All of the Mercy Corps volunteers and the Syrians in particular were incredibly appreciative of the support of our donors. The group faces a number of obstacles: there is no official UN funding for refugees who are living outside the refugee camps (where conditions are very difficult), they can’t raise money directly due to Jordanian restrictions on NGOs, and any goods shipped in to the country are taxed heavily. With the two of us on the ground to withdraw the cash and purchase items directly, we’ve been able to ensure that every dollar you donated went to buy needed items. In fact, we signed and kept copies of every receipt. The team goes shopping approximately every 10 days but it is entirely dependent on when they have donations to finance their purchases. The scope of the need is incredible: thousands of Syrians cross in to Jordan every day, most coming with only the clothes on their backs (there are now over 500,000 refugees here). In-kind donations are difficult because they are of mixed quality and sometimes of questionable appropriateness (Suha mentioned donated miniskirts, espresso machines, and even wetsuits). Furthermore, they must be sorted and washed—Suha told us her kids began wondering why half their apartment was buried in clothing for other people. The clothing we were able to buy has all been cleaned, folded and prepared for sale by the merchants. Tomorrow, we will drive up to Mafraq with other Mercy Corps volunteers. While we are both excited to deliver the truckload of clothing and other items, we are preparing ourselves for stories of terrible suffering. One of the Syrian volunteers told us his brother has been missing since May after being arrested for helping wounded opponents of the regime. Another, a driver, told us that he was imprisoned and tortured for over a month and a half after being caught bringing Syrian refugees to Jordan. The Syrian soldiers holding him captive debated killing him before deciding to leave him for dead in the desert. Somehow he made it to Amman and is now doing what he can to help his people. Many more stories surely await us in Mafraq. But we’re glad to be able to bring meaningful assistance to Syrians because of YOUR donations. Thank you again for all of your love and support. We will send another update when we have been to Mafraq. The support and kindness that we have received from you over the last two and a half weeks has been incredible. To date, we have raised $8,820. Thank you so much. We are leaving tomorrow night on a 10:30pm direct flight to Amman, Jordan. Everything has been organized, reserved, purchased and even shipped in some cases (see below) and we are ready to go. This is our first update. As promised, we will be writing to all of you over the next week to keep you updated on our progress and to shed some new light on a very sad conflict. So here is the schedule. We will spend Saturday and Sunday in Amman shopping with a few local volunteers. Catherine (Director of Resource Distribution at Mercy Corps and our amazing contact who has helped us every step of the way) has identified a few of the most needed items for Syrian refugees living in and around Mafraq, Jordan (see map). She and local volunteers have established a network of dealers who sell items in huge quantities which are then sorted and shipped north. We have already ordered a shipment of powdered milk and formula that is being delivered to Mafraq on Tuesday. We’ll additionally be buying second-hand clothing and shoes for adults and children and sanitary items (i.e soap, diapers, feminine hygiene products). To give you an idea of the amount that is needed, between 2,500-4,000 refugees arrive in Jordan each day and there are hundreds of thousands of people already there. After we purchase the items, they’ll be sent to Catherine’s sorting center where we will help to organize them and load them into trucks to be shipped north. We will then drive to Mafraq and spend the following days distributing items and visiting with families. It is going to be very difficult but Demetri and I are excited to be able to help. We’ve talked with Catherine quite a bit about the state of affairs. People are really traumatized; many are wounded, and the situation is truly getting worse each day. A little goes a long way and the fact that we’ve raised close to $9,000 is just incredible. The impact of what we’ve all been able to do is going to be immediately felt and we are really looking forward to being your eyes on the ground.